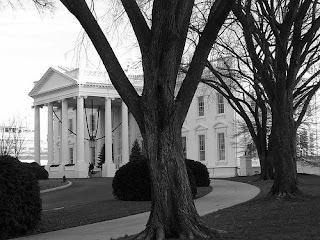 Since we are all feeling patriotic right now, I thought I would write a little about the ghost stories that take place in the First House… the White House. There are many ghosts roaming the white house corridors, as noted by the first families and other visitors and guests of this great historic building. One of the most famous is the apparition of Abraham Lincoln. Many of the first ladies sensed his presence in the White House including Jackie Kennedy and Eleanor Roosevelt! Harry Truman even documented an encounter with the ex-Pres, saying he found him knocking on his office door. Abe’s not the only Lincoln to pop in now and again. His son, Willie, who died in the White House, was seen by Presidents Grant and Taft. Thomas Jefferson is said to have been seen by First Families playing the violin in the Yellow room, and Andrew Jackson is said to enjoy frightening guests in the Queen’s bedroom by making himself known through his deep laughter and spooky knocking. Even the outdoor Rose Garden is said to be haunted by its planner, Dolly Madison. She’s the gal who planted this famous spot and people have reported seeing her apparition wandering through the space- day or night. So, if you ever get the chance to spend the night in the White House bring your ghost hunting equipment! What an amazing yet spooky sight. It's like a ghost museum and you can even interact with the exhibits themselves. Talk about being hunted by history. haha!